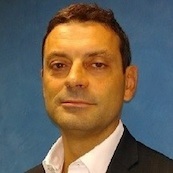 Sebastiano Di Filippo serves as Business Development Director, Qualcomm Europe, Inc. the world’s largest provider of wireless chipsets, software solutions and technologies for wireless communication. In this role, he is responsible for the promotion and development of Qualcomm business in Europe driving the adoption of products, solutions and technologies in the field of connectivity, automotive and Internet-of-Things. Sebastiano is also responsible for the Industrial IoT market in the European Region. At the beginning of his carrier in Qualcomm, Di Filippo worked as product marketing manager for 5 years and prior to joining Qualcomm he held engineering and technical marketing roles in Agilent, Siemens and ANS spa. He started his professional activity developing a new Viterbi equalizer for GSM systems. Di Filippo is a technically sophisticated presenter and technology expert with strength in building executive-level relationships in the field of telecommunications, automotive and consumer electronics. Di Filippo holds a master degree in Electrical Engineering from the UNIVAQ University – University of L’Aquila (L’Aquila – Italy).